Recent research has discovered that our brains can process information 60,000 times faster when reading graphs and pictures than when reading plain text. [i] This is why information graphics, commonly referred to as infographics, are a great tool for businesses. Infographics help with comprehension of complicated facts, figures, and numbers, reduce time spent reading and understanding complex material, and assist in reaching different audiences. However, some benefits of using information graphics can be diminished if they are not used properly. To make sure you are securing the benefits of using an information graphic, you should know when and how to use them. Information graphics are mainly used to help with comprehension, which is why they are more commonly associated with data visualization. However, there can be many benefits of using information graphics beyond breaking down data. Mark Smiciklas’s book The Power of Infographics lists multiple areas in which infographics can be incorporated. Statistics – metrics such as sales, revenue, market research, surveys Process – manufacturing, customer service, sales funnel, lead generation, supply chain Ideas – concepts, theories, thought leadership, ideology Chronology – history, order of events, timelines, schedules Geography – locations, metrics by region Anatomy – ingredients, components, lists Hierarchy – organizational structure, needs assessment Relationships – internal, external, people, products/services Personality – brand humanization organizational culture. 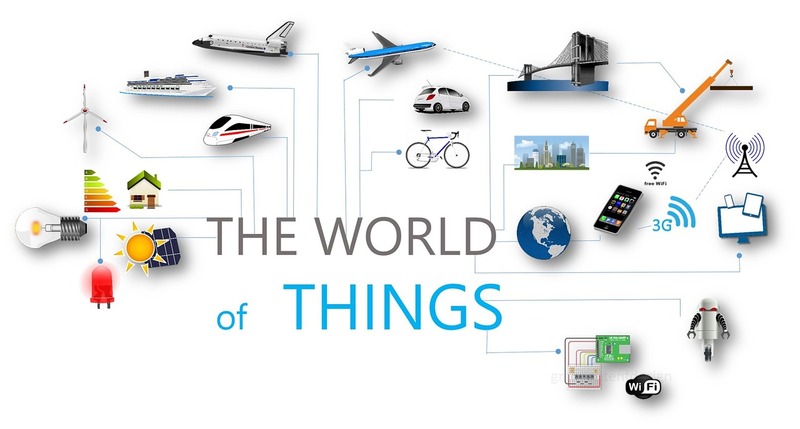 [ii] Identifying the purpose of your information graphic will help increase its effectiveness. 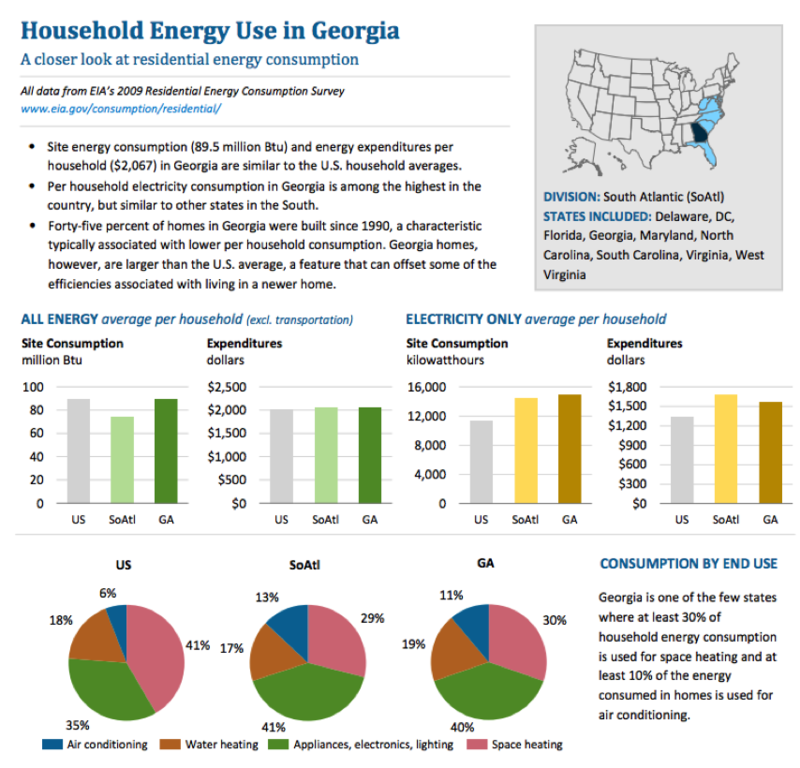 The image below from the Energy Information Administration uses multiple infographics to detail household energy use in Georgia. [iii] The top right corner uses a geographical infographic to detail the location of Georgia within the United States. The middle of the image uses bar graphs, and the bottom uses pie charts, to explain specific areas of consumption. Identifying the purpose of your information graphic can help you find the best infographics for your data. There are many data sources for information graphics, especially for commonly researched statistics. Population, income, and district data are examples of commonly researched topics that can easily be found on the web. However, for organization-specific data such as the salaries of those in marketing, sales, and finance in your own company, you’ll need to gather the data from internal sources. Creating infographics may seem like a time consuming task, but there are programs such as SAS and STATA that allow you to import your data or input the data manually. There are three important concepts to remember when deciding what will create the best infographics for your business: purpose, data, and audience. When creating infographics, you should consider your reasons why. If you are well versed in marketing, you know that the same information could be displayed in a variety of ways depending on the purpose. If the purpose of the infographic is to attract attention, then using more colors and eye-catching details are appropriate. However, if the infographic is for your quarterly report and you’re trying to simplify information, you might want to stick with black and white. The second thing you should consider is how to create the best possible infographic based on the type of data you have. Here are some examples of data types. “Visualized” article – takes an otherwise lengthy piece of writing and makes it visual Flowchart – answers specific questions by giving choices to the reader Timeline – chronological dates that are visualized to make the graphic interesting and shareable Useful bait – A great way to explain something or answer a question by visually showing how to do it Versus Infographic – compares two things and places them in a head-to-head comparison to illustrate their differences Pure Numbers – describes an infographic that oozes impressive numbers, filled with data and statistics Photo Infographic – offers a unique design and can explain something using real-life photos Data Visualization – turns information into something creative and appealing, making it unique and interesting The benefits of using infographics can easily be lost when the data does not correspond to the type of infographic being used. Last, but not least, you should consider your audience. If you are trying to recruit employees using an infographic, one that contains a flowchart of what your company does would be a great information graphic. Likewise, if you’re trying to detail your quarterly report to your employees, the best infographic may be pure numbers. The best infographics use science during the creation process. Gregory Ciotti wrote a blog detailing the results of an eye-tracking study. [iv] From the study, eye-tracking software was able to identify where people looked on a screen when searching websites, which is particularly helpful when creating infographics. “Dead weight” visuals, directional cues, and the F-Pattern are important details to pay attention to when creating information graphics. “Dead weight” visuals are visuals that contain little importance to the website, and waste the viewer’s attention. As Ciotti’s blog points out, TechWyse’s study showed that having a large, unnecessary image distracted the reader from important information such as the company’s contact information. When the study changed the design to remove dead weight visuals, the website experienced a higher response rate. When creating an infographic you want to make sure you’re adding pictures that serve a purpose. Ciotti’s blog also notes, “Human beings have a natural tendency to follow the gaze of others.” This claim is proven with an eye-tracking study featuring a baby facing the user and then again facing the information. [iv] The result was that when the baby was facing the screen, users paid more attention to the baby, and when the baby was facing the information, more people looked at the information. This is a great indicator on how to position people in advertisements and information graphics. The Nielsen Norman Group held a study tracking the reading habits of 232 users and found that the “F-Pattern” was the most common. [v] The F-Pattern is a style of reading that shows that people tend to read in an F shaped pattern, which means they are only reading the first part of certain lines and not reading your content thoroughly or entirely. The Nielsen Norman Group recommends writers should place the most important information in the first two paragraphs and should start subheads, paragraphs, and bullet points with engaging, information-carrying words.”[v] The benefit of knowing about the F-Pattern decreases the likelihood that users will miss out on important information. If you follow these tips, you’ll be on your way to better graphics in no time. [i] Gutierrez, Karla. (2014) “Studies Confirm the Power of Visuals in eLearning”. SHIFT’s eLearning. Aura Ineractiva. [ii] Smiciklas, Mark. The power of infographics: Using pictures to communicate and connect with your audiences. Que Publishing, 2012. 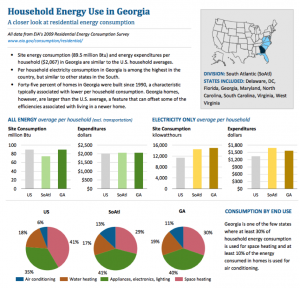 [ii] “Household Energy Use in GA.” Energy Information Administration. [iv] Ciotti, Gregory. “7 Marketing Lessons from Eye-Tracking Studies.” Kissmetrics. [v] Nielsen, Jakob. “F-Shaped Pattern For Reading Web Content.” Nielsen Norman Group.